Follow the true coming-of-age journey of a football player, the bond he built with his coaches and teammates, and his comeback from a serious head injury during a game. We learned the game as friends and became unstoppable as teammates. We were a little wild, crazy and reckless. 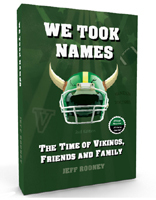 We were Vikings, name takers and brothers, and football needed us. We gave it everything. We'll be remembered not for our victories but our journey and the love for the game. It was made for guys like us. We honored it with our fight and our bond. The book is 516 pages and has over 300 photos and images, consisting of newspaper quotes, articles and headlines. It also has personal photos provided by teammates and photos from yearbooks. Thirty years after the undefeated champion season the team returned for its first reunion at Vanden High school. The book contains the reunion with photos and quotes from some of the teammates. The book also contains "Where are they now"
An emotional, funny, action-filled memoir every parent, coach and football player should read. Know what your kids are feeling, what your players absorb and how to become a champion. Follow the five-year journey of a group of military kids and how they became the best. Their vivid account is told through the eyes of one of those friends. • We picked out two gray hooded zip-up sweatshirt jackets. We took them to the counter and asked the attendant if we could have names added to them. He told us we could, and asked what we wanted. I told him "Psycho" and Jim told him "Maniac." He gave us a double take and said, "What?" I told him again. His look told me that was a first for him. So it was unusual, I thought. We were unusual guys trying to build identities for ourselves. • Hours later, I awoke in the hospital. When my eyes opened I felt the worst crushing and exploding pain in my head I had ever experienced. My throat was dry and my eyes had trouble focusing. Then I heard the bad news. I had a serious head injury, and they needed to run a battery of tests over the next few days. I would have to stay in the hospital. They needed to keep my brain swelling down and monitor it for bleeding. • The three cars filled with our teammates were stopped in front of us. I could clearly see cross traffic on Peabody. Joe still had the pedal pushed to the floor as the truck sped forward. I didn't need a crystal ball to see the outcome. I knew it was going to be bad. We had cut the distance in half to the stop sign. I was sitting next to Joe in the middle with Mark to my right. I yelled at Joe to slow down because there was gravel on the road ahead. I anticipated the coming impact so I put my feet up on the dash. I wasn't wearing a seatbelt. None of us were. • I knew she was scared. She told me more than once how worried she was that I would get hurt again, and maybe even worse. A brain injury wasn't fixable, she said. It could be permanent, she would say. I begged, I pleaded, and I talked about the difference between an air helmet and a regular one. When I was a newborn I had contracted a strep infection, along with another baby, from a nurse at the hospital. We both became very ill. The other infant, a little girl who belonged to a neighbor and my mom's friend, died. That devastation stayed with my mom. She did not want to lose me at 17. Her maternal instincts said no to me playing. Her love for me to be happy said yes. • Finally, Coach Bev came down from the office. At 37 years old he looked seasoned in his third year as head coach. He was only the second man in Vanden's twenty-one-year football program to lead the varsity squad. He also had played on the first football team for the Vikings in 1964, scoring the first touchdown in the school's history. As he walked he limped slightly because both his knees had had surgeries to repair them. The shorts he was wearing showed the surgical scars. • Stretches came next, and as we rolled around on our helmets facing up at the sky, it looked so blue. It was so clear and lasting. I had stared at that sky hundreds of times over the years while stretching my neck. It was like an old friend. It was comforting. I was already sweating and the perspiration on my back was causing the grass to itch my skin. Our practice jerseys were a mesh material so you could feel almost every single blade of grass finding its way through the holes. • When we arrived, the Spartans were already there. As we lined up to do warm-ups I couldn't help but notice how big they looked and how many Hogan uniforms there were. They had more than our team, coaches, equipment assistants, stat girls, and cheerleaders combined. It was just a number, I told myself. I had vegetable soup on my side. Air Force brats who were stuntmen. Some wore no socks and others were named after TV characters. Our backfield was black, our line white, and our linebackers were Asian. We all liked each other and we were friends. We bled green and gold, and we played as one. The Hogan Spartans were about to see why our 1984 Vanden Vikings squad was unstoppable. • There was only one problem. We left Tuck our manager behind, and no one knew. He was retrieving footballs and equipment as we drove away. With arms full he saw the bus leave. He was alone and on his own with an angry Dixon crowd. They knew he was a Viking and he was their target. • The odds were noticing us. We were much closer to that .0089 percent chance of being the best. History had moved to the front of the room to get a better view. It took out its paper and pen to document the end to our journey. We wanted it to write great words. • I couldn't believe what I was seeing. It was a first for me, but it didn't surprise me, coming from Baro. I learned with him to expect the unexpected, but I didn't expect him to start his own huddle as Jeff went to call his. There was Mark, though, five yards from Jeff with his arm in the air yelling "huddle" too. It upset Jeff and he began yelling "huddle" even louder. The Rams, the refs, our coaches, and the fans, were seeing Baro in all his glory. • The quiet in the locker room gave me time to think. In my mind I could see all my coaches as players suited before their big games. I wish I could've met them. As coaches they still carried the remnants of their younger selves, and I could sense those young men honored the game like we did. They had paid it respect through big hits, hard tackles, and taking names. I wondered what words they would tell me or what advice they would give. I was pretty sure they would tell me to play each play like it was my last. They probably would tell me to enjoy these years because the decades will pass fast. It would've been nice to meet those young men and share a few minutes together. I knew I could use their strength before we stepped onto the field to battle the Trojans. • I didn't blame the game for my injury. I knew it was an unfortunate accident. I had been involved with 50 games during my career and had watch easily 50 more at Vanden. I followed all the local schools' games and watched professional and college football. I never saw or don't remember seeing or hearing of a football player being knocked unconscious as long as I had been. I didn't blame the Dixon player who leveled me. I knew that hit, that one moment in time, had shortened my football career and altered my life. What happened to me was rare. I also knew things happened for a reason. I was just thankful to have these twelve games with my friends. I knew one day as an old man the memories of this season would still bring a smile and a longing to do it once more. • How I went from an altar boy and Boy Scout to this personality on the football field I really didn't know. I knew when I shelved my shoulder pads and helmet for the last time, "Psycho" was going to be buried. There was no place for him outside the gridiron. He was created there and would stay there. As my feet left the grass for the last time he and I would part ways. • It was a high-noon showdown at center field. It didn't disappoint. Stares and glares from both sides cautioned of the violence that was coming. Pain would be abundant. The coin toss was thick with testosterone. A coming-of-age true sports drama of friends and football and how the two made them the best.